We’re excited to announce that we’re partnering with Wolf Gourmet again. They have provided Pratesi Living with one of their high performance products for our review and one for one lucky reader. That could be you. Read on to learn about how you can win a Wolf Gourmet Blender. 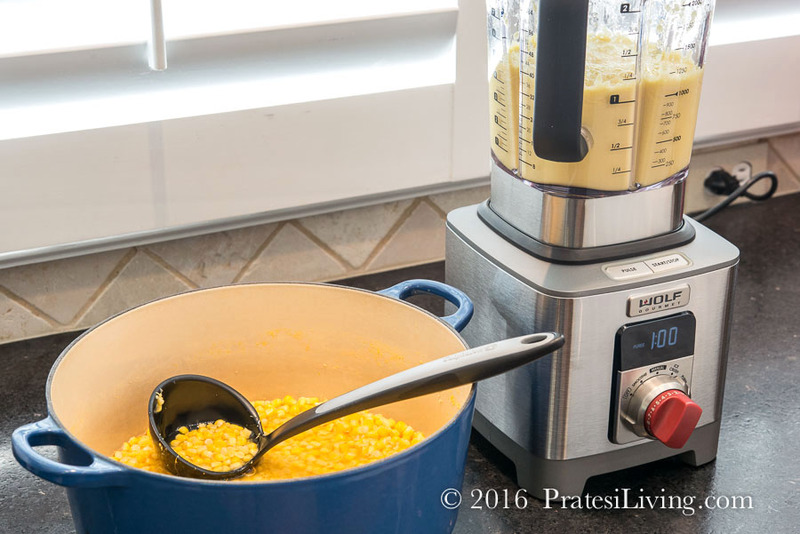 Several months ago we were invited to work with Wolf Gourmet to do a review of their new line of Wolf Gourmet Cookware and create a recipe using one of the pans. We were very impressed with the cookware and how quickly it responded to and held the heat. We also liked the stay cool and comfortable handles and several other impressive features, so we replaced some of our prior favorite pieces on our kitchen pegboard with the new pans and have thoroughly enjoyed working with them in the kitchen. When we were contacted again by Wolf Gourmet and asked to review another one of their other products, the Wolf Gourmet Blender, we were excited to see how this high performance appliance would compare to other professional blenders we use. The polished stainless steel base and shatterproof 64-ounce Titan Jar are heavy-duty and weigh a total of 13 pounds. The height of the blender (17 1/8 inches) will fit under standard kitchen cabinets. When in use, at even the highest speeds, the base is very secure on the countertop with no movement. The jar also stays squarely on the base with no jiggling and no liquids leak from the tight-fitting lid and emulsion cup. 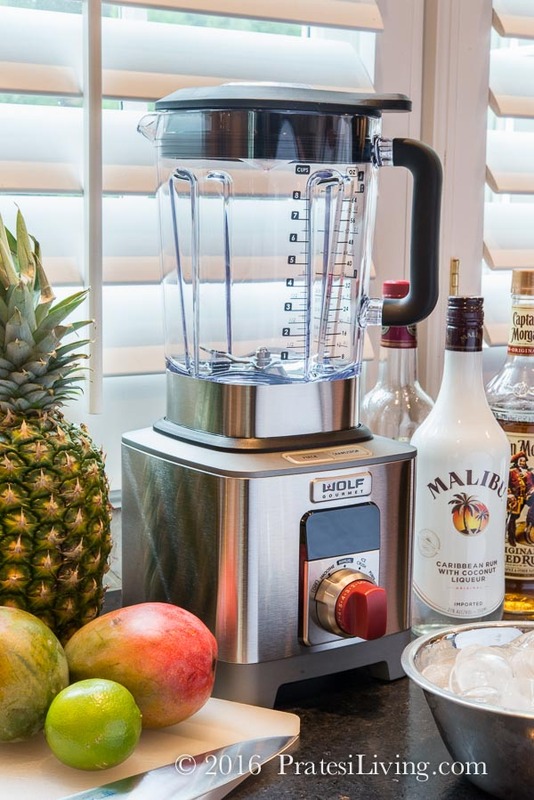 The blender has four timed settings for smoothies, ice crush, purée, and soup and a manual setting with a variable speed adjustment, which transitions smoothly and is quick to respond to the increase in speeds. We also like that the blender is very quiet. The obvious competitors in this market and price range ($599.95 at Williams-Sonoma) would be Vitamix and Blendtec. While we have not used a Blendtec product, we do have a Vitamix 750, the professional version. That motor has 2.2 horsepower and the Wolf Gourmet Blender has 2.4 horsepower. The Wolf does seem stronger. The two products have similar features and settings, although they are not exactly the same. The one noticeable difference is the way the jar sits on the base. The Wolf Gourmet Blender is very secure (as mentioned above) whereas the Vitamix jar wiggles and it’s not locked into place, so that is a big plus for me. I feel like I can walk away and leave the Wolf Blender, even on high speeds, and not worry about anything going wrong. We also tried out the ice crush feature, which pulses from low to medium for a total of one minute, to achieve the right texture. We first tried this with ice produced by our Scotsman ice maker, which produces “wet” ice. When we asked for ice from a neighbor and used traditional ice, it worked much better, making great crushed ice perfect for serving cocktails. I also made one of my favorite smoothies (recipe coming soon) using the timed smoothie feature. The beverage was perfect in 45 seconds with a slightly frosty/frozen consistency and was completely blended. I did not have to use the tamper tool that comes with the blender, even though I started with mostly frozen fruit and very little liquid. 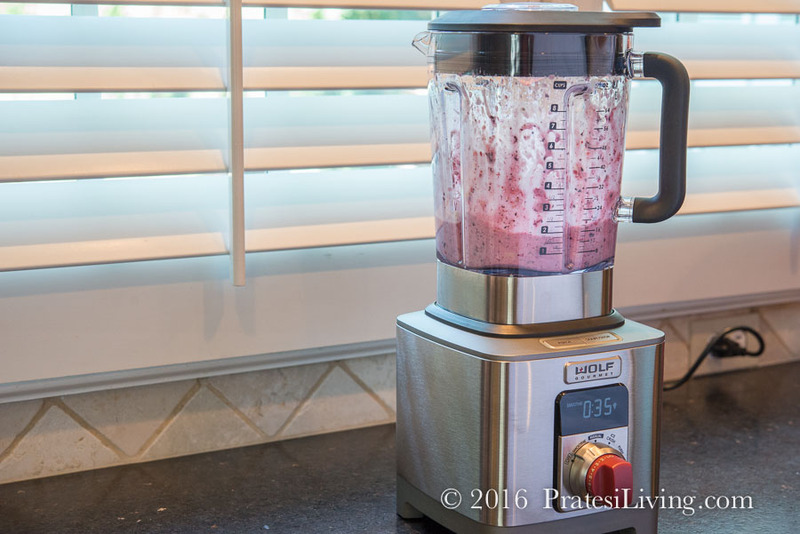 With the programmed five initial pulses to chop the frozen ingredients or ice at the beginning of the cycle, it does the work for you and the timed smoothie cycle was just the right amount of time to get the ideal consistency. Of course, with any of the timed settings, you can always switch to manual operation and purée for a few more seconds, if you’d like. 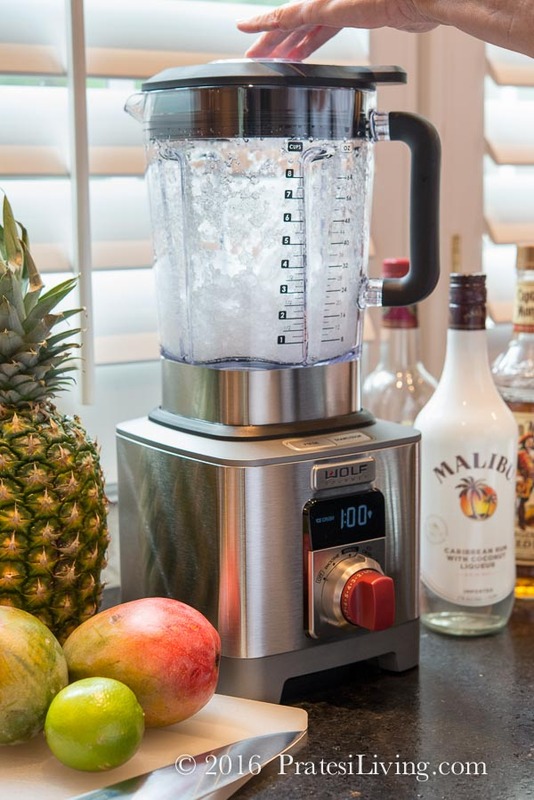 As with all high performance products, people may think of them as just that – for using in special (crushing ice) or extraordinary situations (making hot soup), but this is a regular blender, too. It should sit on your counter and be used for everyday cooking and making ordinary things like nut butters, whipped cream, salad dressings, milkshakes, mayonnaise, and puréed sauces. For a quick cleanup, fill the jar about halfway with warm water and a few drops of dish soap and blend for about 30 seconds. This will work well for most uses, but it’s also good to do this after especially messy recipes to make further cleanup easier with final hand-washing and warm soapy water in the sink. I didn’t have to think long and hard about what recipe to make and feature with the crazy hot summer we’ve been having. I knew something boozy and icy cold would hit the spot. 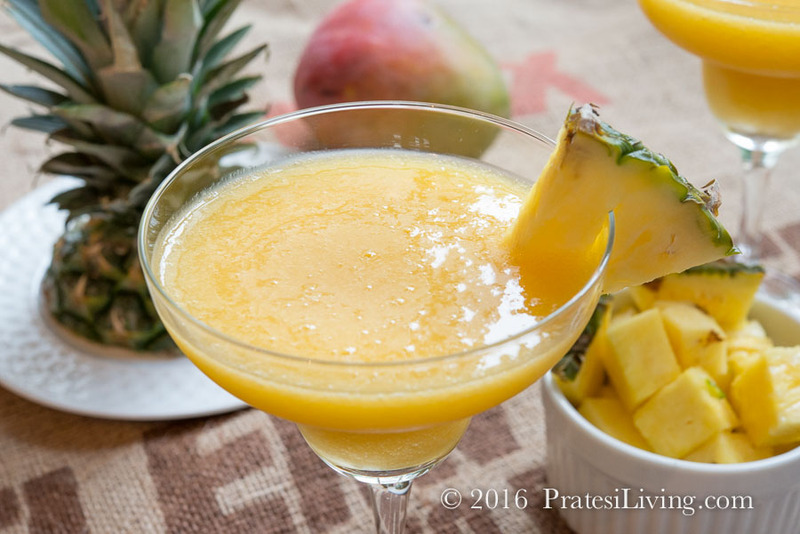 And since we just returned from the beautiful island of Nevis in the West Indies and had attended the Nevis Mango and Food Festival…a Frozen Mango Cocktail it is! I tried a few combinations of fruit and rums in this drink and we decided after several rounds of tastings (I know, it’s a tough job. ), it was best to keep things simple. I first prepared the drink with mango and pineapple, going for island flair, but the mangos we purchase locally have a slight hint of pineapple flavor, so the pineapple overwhelmed the mango. We decided the same thing with the coconut rum. It was overpowering with too much coconut, even when blended with another rum. 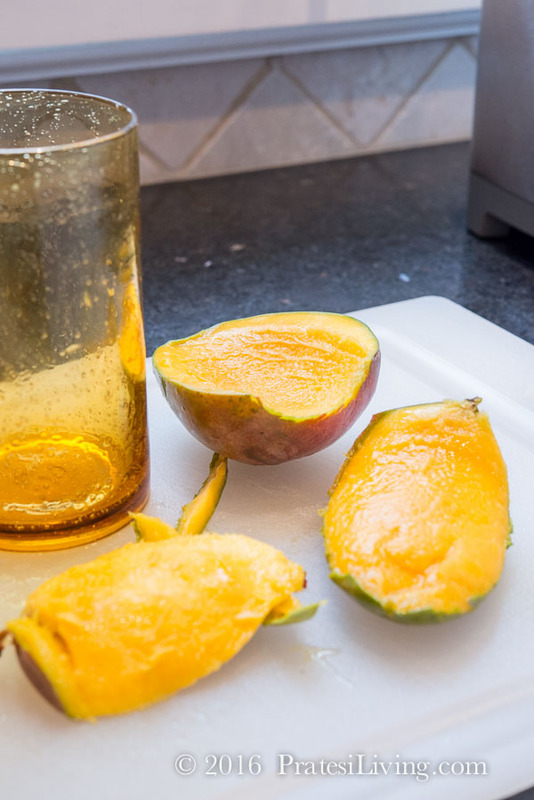 The easy way to peel mango away from the pit – ingenious! Slice the fruit in half longways and slide the fruit down with the seed pressed against the side of a glass. For this mango cocktail we finally found the perfect blend of mango, with a slight bit of sweetness, and it’s nicely balanced with freshly squeezed lime juice. Captain Morgan Spiced Rum gives it the right amount of rum flavor with just a hint of spice. And it wouldn’t be a Nevis inspired drink without a zesting of fresh nutmeg on the top. Nevisians like to top some of their cocktails with fresh nutmeg, including the rum punches I tried while on the island. It adds a bright finish, similar to a dash of bitters, and pairs nicely with mango. Depending on the sweetness of the mango, you might need to add more or less sugar or lime juice, so adjust accordingly, to taste. Purée all of the ingredients just until the cocktail is icy and the mango is smooth and enjoy immediately. Don’t forget the nutmeg! Congrats to Dorothea of Washington State on winning the blender! 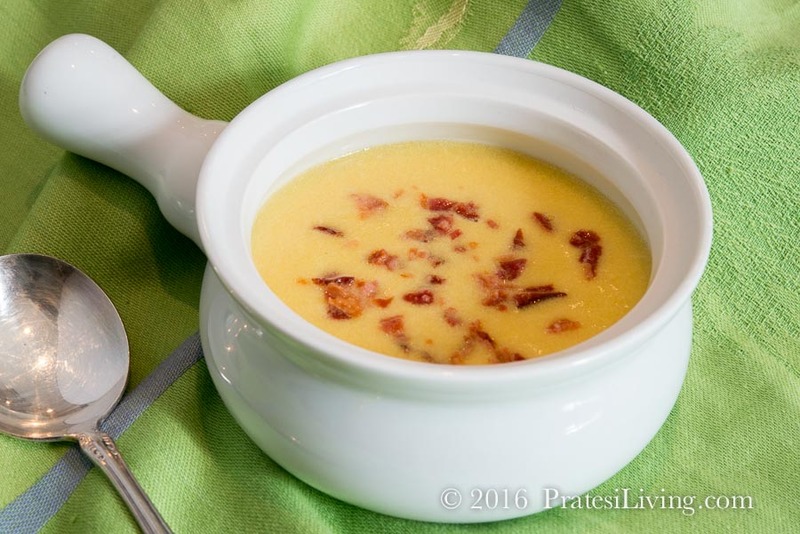 For new visitors – Subscribe to PratesiLiving.com and leave a comment on what your favorite thing is to make with a blender. For current subscribers – Leave a comment on what your favorite thing is to make with a blender. For Premium Members – You are already enrolled and don’t need to leave a comment. Wolf Gourmet has offered to host a Wolf Gourmet Blender Giveaway and will be sending one of these awesome blenders to one of our readers. To enter the giveaway, you’ll need to subscribe to updates via the subscribe form on our site (click here) AND leave a comment as to what your favorite thing is to make with a blender. After you sign up you will receive updates as new articles and recipes are published as well as notification of future giveaways. You can also choose to subscribe to our Premium Membership with full access to all the content on our site as well as automatically being enrolled in future giveaways. The giveaway ends on August 10, 2016 at 5 pm EST, so enter today. Note – The blender can only be shipped to a winner in the 50 United States and it cannot be sent to a P.O. box. Place all ingredients in blender, except for ice, and blend a few seconds to combine. Add ice and blend on manual setting, just until mixture is still icy and smooth. 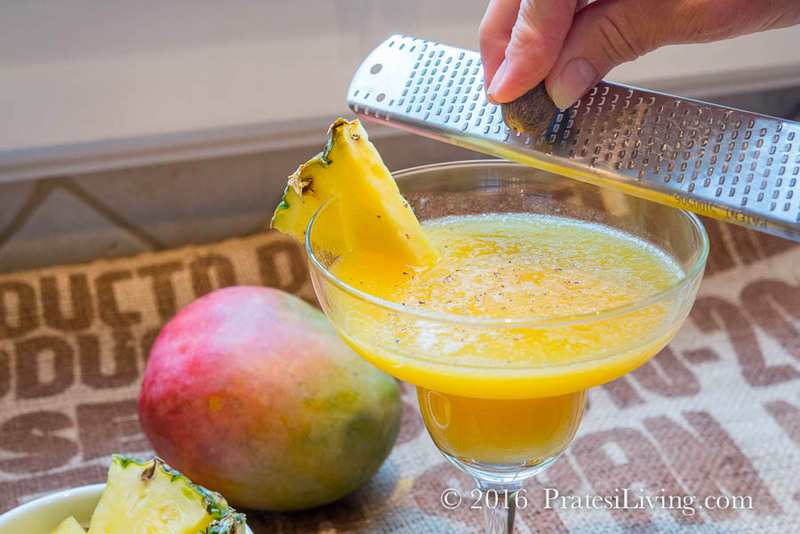 Serve immediately, garnished with nutmeg and a pineapple triangle. My favorite thing to make in a blender is smoothies. I’m a current subscriber. Thanks! I love your site! My favorite things to make in my blender are dark chocolate almond butter and herbed cashew cheese. I love making my protein shake every morning in my blender. 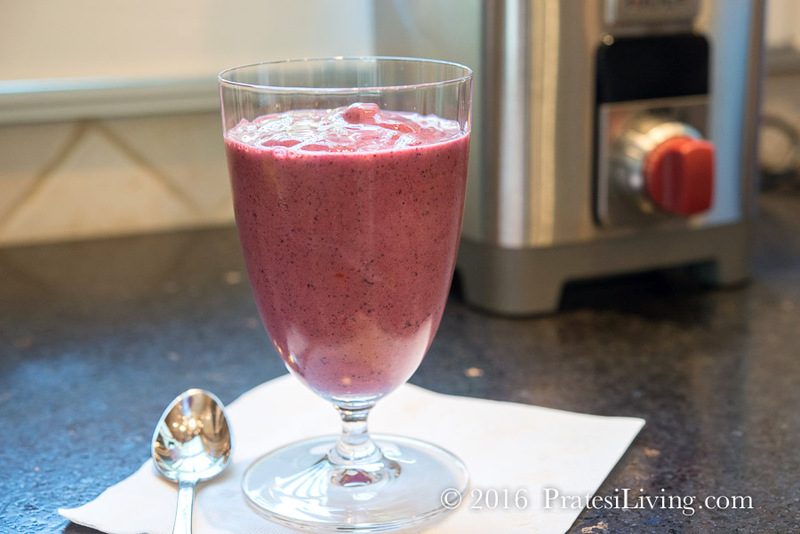 What I like to make in a blender is chocolate mousse, but I make a lot of smoothies also. Love the look and sound of this Wolf Blender! It’s really amazing all that the blender is capable of doing. I have always heard such amazing things about all things regarding Wolf Gourmet. I would love to make a berry smoothie with fresh squeezed orange juice, a berry assortment and extra chia seeds! I would love to make my favorite scones, Swedish meatballs, and pizza dough! My favorite thing to make in a blender is soup. Hummus! Easy, healthy, and way better than store bought. 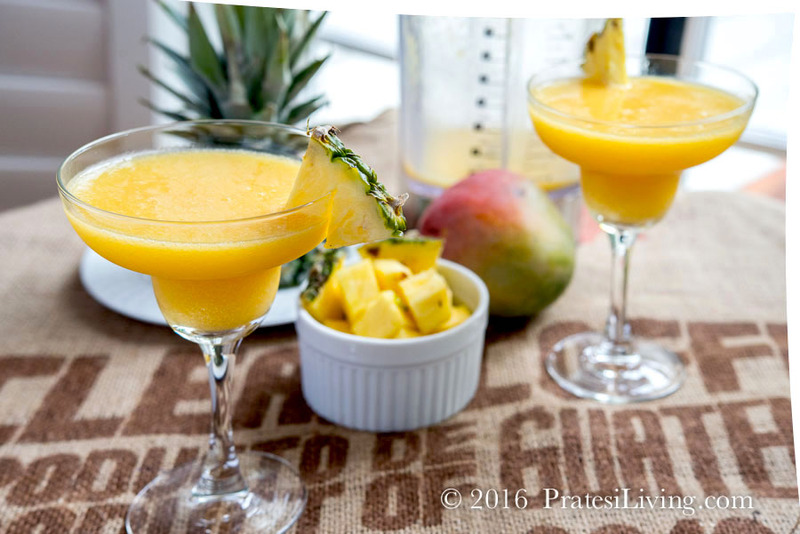 My favorite thing to make in a blender is mango smoothies and fresh fruit sauces! My favorite thing to make in the blender is soup. I love to make fruit smoothies in a blender. I also have a great recipe for blender cheesecake. I have a very old blender which I have used to make smoothies. However it’s so old I can’t add any ice since it won’t crush it. Would love to win the Wolf Blender to try more sophisticated recipes since we are trying making healthy food choices. My favorite is strawberry margaritas! I love making smoothies with my grandson. We finally found a healthy treat and love making them together. His favorite is orange; banana; blueberry; strawberry. My favorite thing to make in a blender are the smoothies that my 5 year old son requests that I sneak Super Veggie juice into. I love a good gazpacho or chowder! Thanks for the chance to win this amazing blender! My family’s favorite smoothie that I make is apple juice, vanilla ice cream, fresh blueberries, pineapple. So delicious! I would make a margarita . I love using a blender to purée pasta sauce. My favorite uses canned San Mariano tomatoes, onion, celery, carrots, basil and olive oil, all simmered then puréed into a velvety sauce that clings beautifully to pasta. My favorite thing to make in a blender is a margarita. I would love the timed soup setting. That sounds awesome!! My favorite thing to make with a blender is a smoothie with greek yogurt, orange juice, strawberries, mango, and pineapple. I like being able to get protein and all my fruit in early in the morning! Id use this blender for all things smoothie! Mango, pineapple, soursop, coconut, did I mention MANGO!!?? anything to beat this Caribbean heat!! I love to make a delicious smoothie with frozen bananas, chocolate almond milk and peanut butter. My favorite things to make with a blender are agua frescas, smoothies, and gazpacho andaluz. I love to make smoothies with all the fresh and frozen mango from my tree. Like everyone else, I enjoy making smoothies and frozen drinks. I think a piece of equipment like this would make me want to be more creative and do things like make hummus, pesto, or nut butters. Smoothies, all day long; definitely my favorite thing to make with a blender. I am a current subscriber. I love the blender for frozen fruit/protein smoothies.